It was a very convenient location from the train strand was well connected by bus and trams. The unique aspect about this hotel is their keen eye towards eco friendliness and get the rooms were spectacularly trendy. When booking you may not get a hotel room but an apartment around the corner from the main hotel entrance. Very nice room, 2nd floor, no elevator. Where to find La Riviere-Saint-Sauveur hotels near an airport? Where can I find hotels in La Riviere-Saint-Sauveur that are near tourist attractions? 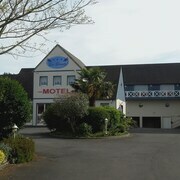 Visitors to Calvados will discover a generous range of hotel options to select from in La Riviere-Saint-Sauveur. We currently offer at least 29 accommodation options within a 0.1-kilometre (0.06-mile) radius of the heart of La Riviere-Saint-Sauveur. The La Fraîchette is a much-loved hotel option as it's conveniently located to La Riviere-Saint-Sauveur's heart. 4 kilometres (2 miles) away from the center of La Riviere-Saint-Sauveur, is the La Ferme Saint Simeon. 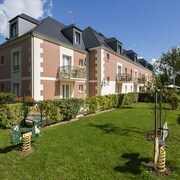 Alternatively, the Hôtel Barrière Le Royal Deauville is situated 16 kilometres (10 miles) away. 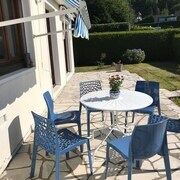 Two other Expedia-listed options around La Riviere-Saint-Sauveur include the Hôtel Barrière Le Normandy Deauville and the Hôtel Barrière L'Hôtel du Golf Deauville. 15 kilometres (9 miles) from La Riviere-Saint-Sauveur is Deauville, where you can spend the day enjoying Deauville Beach and Deauville Casino. If you'd like to spend a few nights in Deauville, check out the La Closerie Deauville and Best Western Hostellerie du Vallon. 45 kilometres (29 miles) to the west of La Riviere-Saint-Sauveur, you'll find Seine Bay, home to the Hôtel des Thermes et du Casino and Le Beau Rivage. While visiting Seine Bay, make sure you visit the Juno Beach Centre and Aquanacre. If sport is a favourite pastime, make the time to visit Deauville La Touques Racecourse, which is 15 kilometres (9 miles) to the southwest of La Riviere-Saint-Sauveur. Those sports fans wishing to find a bed close to the action can choose from the L'Augeval or the Hotel Le Trophée. 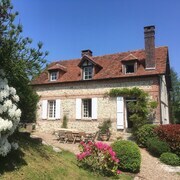 If you are traveling into or out of Saint-Gatien Airport and are looking to stay nearby try Auberge de la Source or Manoir de la Poterie & Spa. What are the most popular La Riviere-Saint-Sauveur hotels? Are there hotels in other cities near La Riviere-Saint-Sauveur? What other types of accommodations are available in La Riviere-Saint-Sauveur? Explore La Riviere-Saint-Sauveur with Expedia.ca’s Travel Guides to find the best flights, cars, holiday packages and more!